Searching for fair price and excellent quality? Well search no more! We have plenty of choice including round base pad eyes here at Rope Services Direct. Round base pad eyes are perfect for affixing chains, rope and wire to a variety of different surfaces. 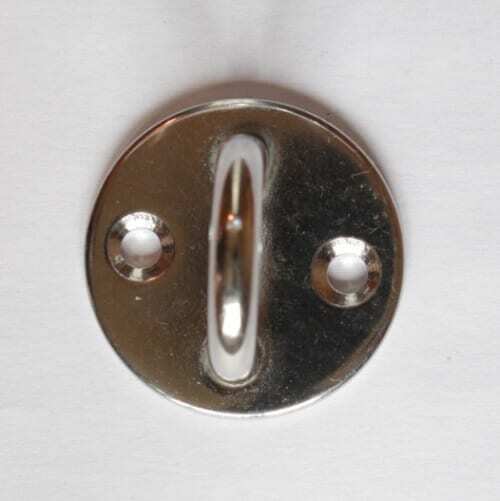 They’re also ideal for mounting blocks and are also used for attaching stay sails and reefing blocks to boats. Additionally, they’re useful with fibre rope for making features in gardens, tying up gates, for use on boats and much more. Note that as they’re circular, they cannot be placed closely together. If you need ones which sit close together in numbers, you may instead wish to choose diamond or oblong base ones instead. Rust-proof and durable, the pads contain either two or four holes for easy attachment. The eye is then used for clipping in our snap hooks. Not feeling too confident? You’re not alone so perhaps also browse our shackles and chains and hooks as well. As if that wasn’t enough, there’s a massive variety of wire rope to use with your round base pad too. UK-based Rope Services Direct has the ability to sell a large selection of round base pad eyes in one place. To tell us what you want, just send us a speedy enquiry form. For advice or if you have any queries, call us on 01384 78004. Round Base Pad Eyes Overall rating: 5 out of 5 based on 6 reviews.